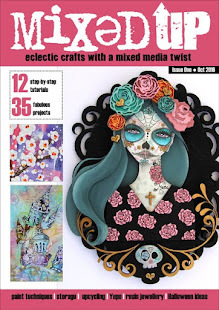 Re-edited: Yay, my card has been chosen as a top pick in the Top Tip Tuesday challenge!!! Now that we've been finally enjoying some sunshine in the UK and I've been able to spend some time in my lovely new garden. And I got really excited when a couple of butterflies found their way to our garden - sadly, I seem to see fewer and fewer butterflies each year, does anyone have any idea why? So I thought I would share this card to celebrate this happy occasion and show off the beautiful wings of these small adorable creatures. Some of you might remember this card from a Create & Craft show back in April :). I wanted the wings to be the focal point of the card, without any papers or embellishments steeling the shine from it. So I decided to turn to my good old matt emulsion paint to tone down any patterns and to keep the colour palette uniform. And here is what I came up with. My butterfly was going to sit on a flower so I needed to create a big dimensional 'platform' with petals :). As I was going to paint over the papers anyway I decided to rummage through my box of scraps to pull out a selection of papers that I could cut into squares. It reminded me a bit of a Scrapheap Challenge, a TV show in the UK where teams run around a scrap yard to find various objects that they can use in the structures they are challenged to build :). 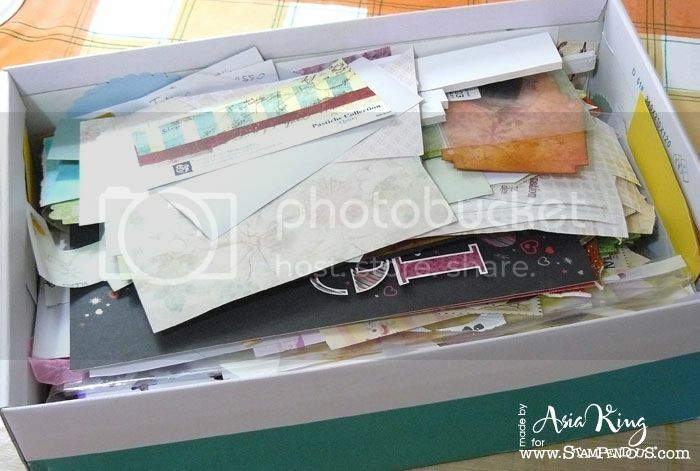 I cut my papers to about 2"-3" squares - they don't have to be precise. Next I rolled them into tubes and added some glue to hold them in place. I used tweezers to help me roll the paper inwards. Next, I arranged the tubes over my background into a round-ish flower and glued them in place. Once the glue was dry I dry brushed my flower with matt emulsion paint. 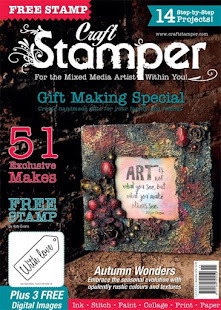 Then I swiped the petals with Boss Gloss, sprinkled some Shabby Blue embossing enamel and zapped it with my heat tool. 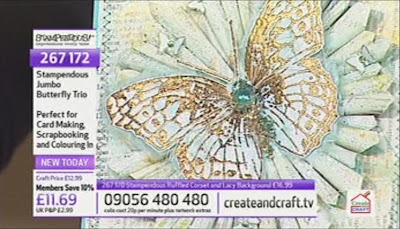 The main butterfly from the Stampendous Jumbo Butterfly Trio was stamped onto white card and heat embossed with Gold Detail embossing powder. Then I added a touch of colour with STAEDTLER ergosoft aquarell pencils and cut it out. I also stamped additional butterflies on my background panel (old book pages) with light ink and coloured with pencils and shimmer paints. 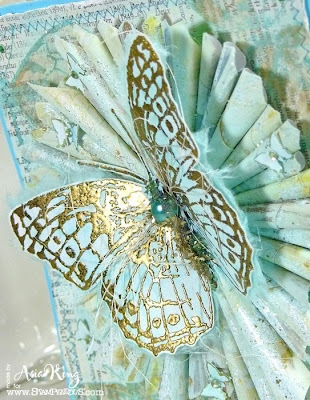 I layered the main butterfly on a fluffy mulberry paper and embellished the body with Champagne and Steel Blue glass glitters. I hope you enjoyed this quick and easy project today :). 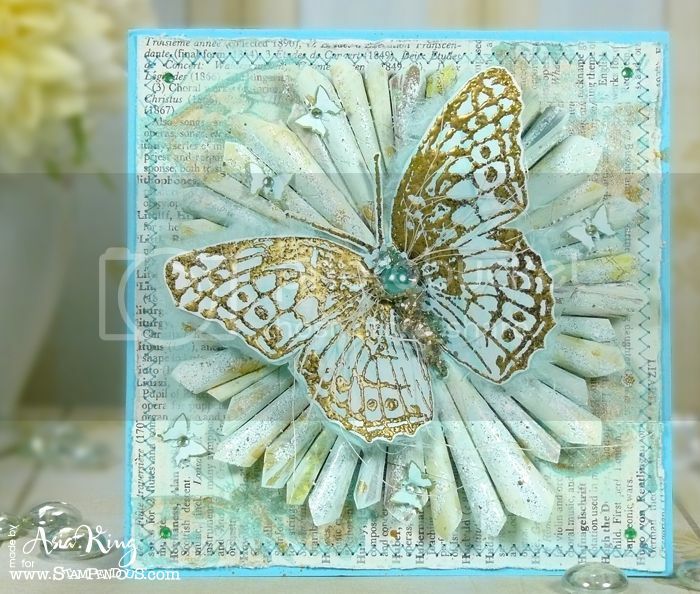 I really love this big butterfly image, it's so versatile and it works great as a focal point, just like on this winter butterfly birthday card here. I'm still travelling so I will catch up on visiting your beautiful blogs when I am back. 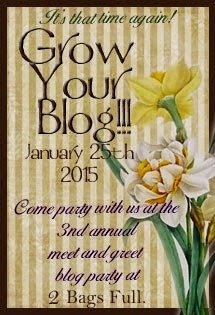 Before I go - have you joined my Big Birthday Bash celebrations yet? 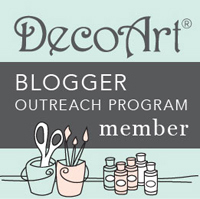 Be sure to join soon, you don't want to miss the chance to win some fabulous goodies! Oh my goodness this is amazing ... what a clever design and the colours are beautiful! Such a beautiful creation, love the blue and gold. I'm no expert Joanna, but I am told the demise in butterflies like several of our traditional garden birds is all down to the changes in climate coupled with the very hard winters the last couple of years. So sad to see familiar wildlife decline. But your artwork is totally delightful and so very inspirational. beautiful card Joanna. 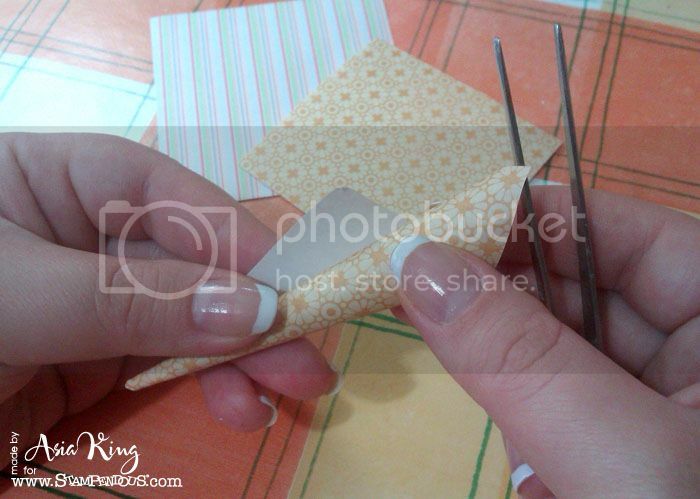 love your innovative use of the rolled squares for the base of the butterfly. So super beautiful, Asia! What a lovely project. Thanks for the tutorial on making the flower!! This is beautiful. I love the colours you have used Joanna. If you want butterflies in your garden plant a Buddleia and you will have it covered with all the butterflies you could want every year it attracts very unusual ones. You have to provide the habitat for the insects and creatures that you want in your garden you can make it just how you would like it with a little planning! Beautiful Joanna, the colours and dimension are wonderful with that glorious butterfly. Your work always amazes me. This is gorgeous my friend. I LOVE it. Such a stunning card, lovely layout and gorgeous colors! The butterfly looks fantastic! Just brilliant - the flower is a complete knockout, and I love the glamorously gilded butterfly. Thank you for the Birthday reminder - I'm finally back online, so off to sort it out! Oh, and we seem to have plenty of butterflies - they definitely come for the Buddleia - they flock around it! 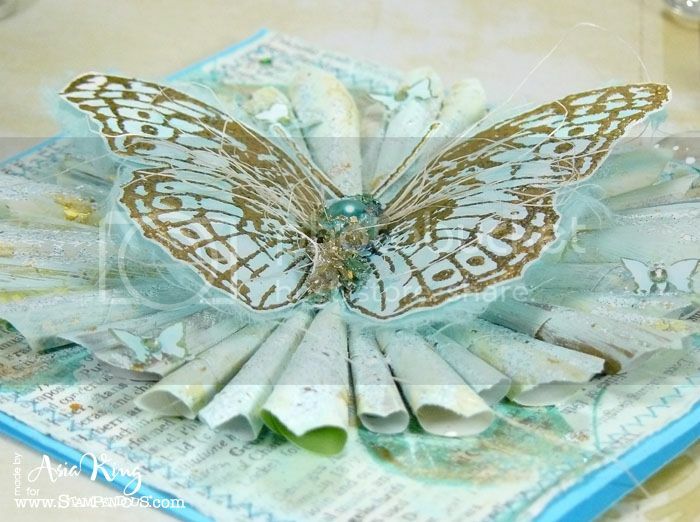 Such a striking butterfly Joanna so loved reading your post and seeing the tutorial on how you made it all.